The Next Stage: Women and Retirement: Thank you Jimmy Carter! Thank you Jimmy Carter! Finally one of our political leaders has spoken out against the racism underlying right-wing extremists’ opposition to health care reform. I believe that a relatively small number of people are responsible, but their influence is magnified by media coverage of their attacks on President Obama. The extremists gain legitimacy when leaders of our society appear reluctant to condemn implicit and at times frighteningly explicit racism. Although journalists (e.g. Maureen Dowd, Barbara Ehrenreich, and Joan Walsh) have begun to speak out forcefully, for the most part our elected officials have been silent. 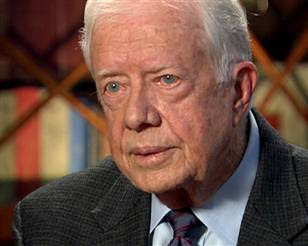 Let’s hope Jimmy Carter's example encourages other leaders to speak out. It’s time for fair-minded citizens to make their voices heard. I'm inspired to do some real traveling again!